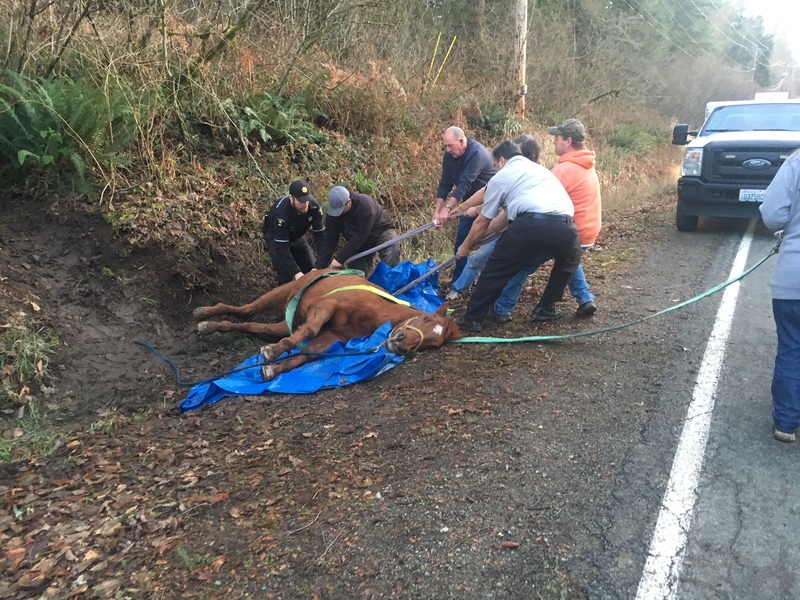 On Christmas Eve, we got a call about a horse stuck in a ditch. 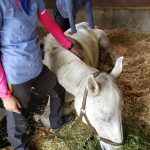 Upon arriving on scene, it seemed to be a fairly straightforward matter — Flame, a senior horse was down in some muck off the side of the road. She couldn’t get any kind of traction with her hind legs so she settled down to wait. 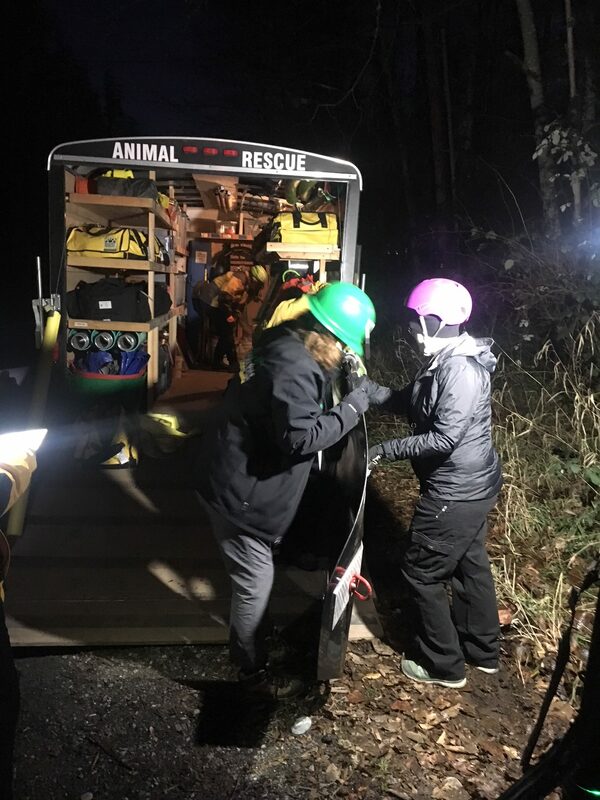 Flame’s owners and some friends, other passersby, and a couple of King County, WA, animal control officers had put some straps on her and a tarp underneath to attempt to pull her out (see photo). We asked them to take a break while we waited for a bit for the equipment vehicle to arrive. Flame decide to lay all the way on her side and have a nap. We put some blankets on her and padded the ground so she wasn’t laying with her eye in the dirt and rocks. The vet, Dr. DeWard, of Mt. Rainier Equine, arrived just before our equipment and assessed Flame and her situation and remained on scene to lend assistance. Once the equipment arrived, we adjusted the straps already on her and added another that gave people pulling more reach. We’d decided we needed to move her away from the ditch and to flat ground to give her a chance to stand. Since we hadn’t seen much effort from her, we thought there was a good chance we’d need to set the tripod up for a raise. We pulled her onto the glide, and moved her across the road to a wider spot where we could set up the tripod if needed. At our destination, we were moving the straps to be in position for the next step when Flame gave a good effort and managed to stand on her own. Dr. DeWard checked her out. She was able to walk home under her own power with her owners beside her. We’re really grateful for everyone who were able to change Christmas Eve plans to come out and assist with Flame’s situation.